Chair, Ottoman, sofa with fabric swatch. Using peppers and tomatoes I brought home from the farm, I made jalapeno (how do I add a tilde on this damn thing?) salsa per Mike’s recipe and it is, frankly, divine. Super spicy, totally fresh, and of course, salt-free. 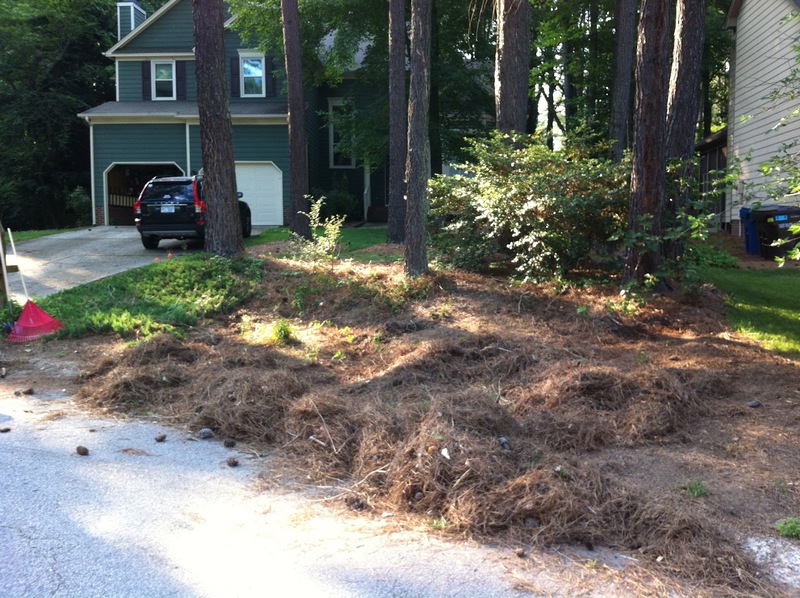 We’re planning to replace all of the pine straw with fresh pine straw, but need to get rid of all the random plants, weeds, and vines plaguing our front yard. The picture above shows the yard a little over halfway through my marathon. I find raking entirely addictive; I love it because it gets me outside and active. And in the front yard instead of the back, I get a better chance of visiting with my neighbors and getting some sun. All around, a good gig. 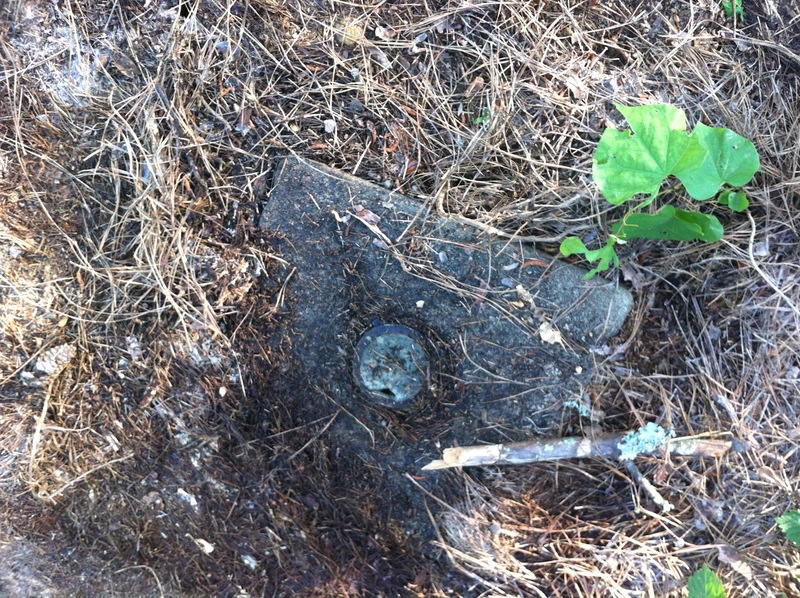 Above: the hatch from “Lost,” a random drain, and an unlikely tulip with a pretty treacherous vine as a neighbor. I was reminded, as I was scraping away the layers of my yard’s many years, that my interest in yard work is not unlike my interest in literature. Don’t roll your eyes. You knew this was coming. If you can, zoom in to see its tongue out! I was startled, of course, and then worried that I might have hurt it in some way. 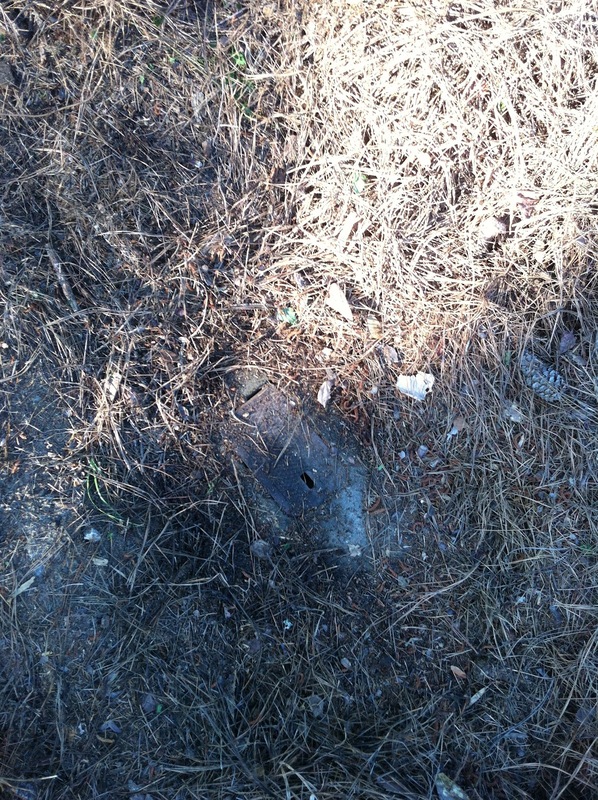 It was extraordinarily slow until I stepped towards it; it then slithered, I hope healthily, away. I then thought about what I was doing– all day I’d seen beetles and ants, a worm here and there. I’d uprooted weeds and pulled back vines. I was definitely affecting a mini-ecosystem (stay with me– I promise this isn’t about to go crazy hippie on you!) 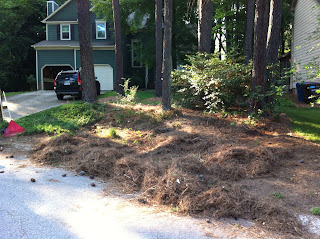 But I did really begin to consider myself a custodian, rather than an owner, of my own yard. After all, this is my third raking snake, and that got me thinking about my scholarship as well. The pieces I work on are very, very old. They have their own birth stories and their own growth stories. They’ve passed through countless hands, crossed countries, and ended up recopied and now, scanned and on a computer screen. And while authorship is a difficult matter, especially in chronicles whose composition actually spans centuries, I should always be aware that they are someone else’s creation. They are bequeathed to me, but never mine. I’m participating in a community of scholarship in the same way that I’m participating in my own little ecosystem. It’s exciting and challenging; it’s rewarding and productive. Its discoveries are delightful, and I claim those moments of uncovering rather than those of creating. I scrape instead of sow. Until next time, wishing you a summer full of revelation and, if it’s your thing, invention as well.